Do you want to create and sustain a culture of continuous improvement in your organization? If so, this is the workshop for you and your team! These workshops (half day, full day, or more) can also be held onsite at your organization. Also check out our on-site, roll up your sleeves, action-oriented “Kaizen Kickoff” workshop that can be tailored to your organization’s needs. Fantastic day with @MarkGraban leading an excellent Healthcare Kaizen workshop. Thanks for an inspiring and extremely useful session, Mark! See this PDF from a previous workshop… this can be done on-site for your organization. 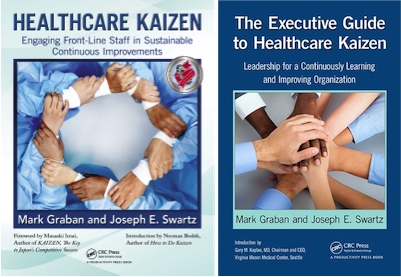 Join speaker, author, and consultant Mark Graban for a small, intimate workshop to learn and practice methods from his book, Healthcare Kaizen: Engaging Front-Line Staff in Sustainable Continuous Improvements. You might have heard about other healthcare organizations that are using “Lean” improvement practices. In particular, many health systems are using “Rapid Improvement Events” (aka “Rapid Process Improvement Workshops”) as a way of driving change. However, a growing number of organizations are also embracing “daily Kaizen” — or a process to facilitate small, meaningful changes as an ongoing continuous improvement methodology. If your organization has not yet started “going Lean,” then daily Kaizen is a great way to get started before making the leap into larger events. Attendees will learn through lecture, discussions, and a hands-on exercise that brings the Kaizen improvement methodology to life in a fun way. Registration is limited to 20 people to ensure a high level of interaction. A fun, interactive exercise brings Kaizen practices to life! How does Kaizen fit with the “Lean” methodology? How is the Kaizen methodology different than suggestion box systems? How are healthcare organizations using Kaizen on a daily basis? How does daily Kaizen fit with weeklong improvement events or workshops? What is required of leaders to create a culture of continuous improvement? How does a department initiate, track, test, document, and share Kaizen ideas? What are some common mistakes that are made in a Kaizen program? I hope you will discover, as we have, the incredible creativity that can be derived by engaging and supporting each and every employee in improvements that they themselves lead. Unleashing the energy and creativity of every employee to solve problems everyday should be the sole focus of every healthcare leader. Unfortunately, there are only a handful of examples where this is happening. Healthcare Kaizen provides examples of front line staff coming up with solutions to problems on their own and implementing them. Healthcare leaders need to read this book to understand that their management role must radically change to one of supporting daily kaizen if quality safety and cost are to improve in healthcare. Continuing education credits are not offered through this workshop, but a certificate of participation will be given. Mark is a popular speaker at conferences and private healthcare meetings. He has guest lectured at schools including MIT, Wharton, and Ohio State University and has served as a faculty member for the ThedaCare Center for Healthcare Value and the Institute for Healthcare Improvement. He has been quoted and interviewed in many publications, including Health Affairs and the New York Times.